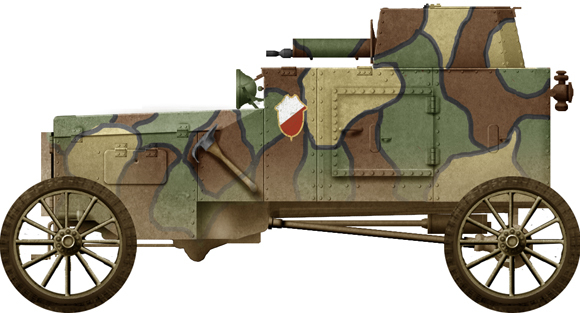 The Ford TF-B was one of the more successful armored cars designed after the end of WW1, and the first locally-built Polish armored vehicle. It is also called Tf-c or simply “model 1920”. Until the arrival of the Blue Army in Poland (which introduced a dozen of Renault FT tanks), there were no armored vehicles in service. It was Tadeusz Tański, inventor and member of the Ministry of Military Affairs, that introduced the idea of converting the Ford T chassis (then largely available). 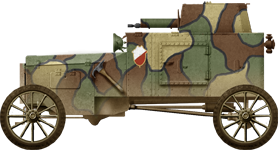 During the battle of Warsaw, the only armored cars in Polish service were captured Austin-Putilovs, and there was a need for a light and fast recce vehicle. The Ford appeared as a perfect fit. The prototype was built in only two weeks at the Gerlach i Pulsing works in Warsaw. Tests were performed, and the vehicle proved successful. A quick production run of 16 or 17 vehicles followed, immediately dispatched to front-line units. The Ford FT-B was a fairly small vehicle, and the chassis and levers had to be significantly reinforced, whereas the fuel tanks were moved to the rear. The front starting crank was extended in order to pass through the armored calender and the dashboard was modified. The whole armor (590 kgs) was handmade out of scrapped German armored trench shields, bolted to the chassis. It provided all around protection against small arms fire (3 mm/0.18 in on vertical surfaces, to 8 mm/0.31 in on the sides). The driver could see through a folding slit, and two pistol ports were positioned on each side. Access was granted by small side hatches. The biggest advantage of this model was its fully traversing one-man turret, housing a 1 x 7.92 mm (0.31 in) Maxim 08/15 liquid-cooled machine gun, with 1,250 rounds in store. 25 hand grenades were also stored inside. Mobility was excellent. The original vehicles already had rugged suspensions, well suited for bad roads and the countryside back in the US. The Ford F-TB proved very fast (for armoured cars) at 50 km/h (31 mph) on flat ground. It was propelled by a 4-cylinder 2.9 L water-cooled gasoline engine which developed 22.5 hp. The power/weight ratio was 16.6 hp/t. 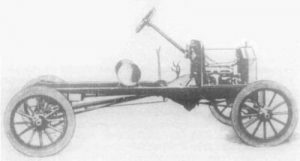 The engine was connected to a planetary gearbox with two forward gears and one reverse (rear axle drive). The suspensions comprised transversely mounted semi-elliptical springs for each of the axles. Autonomy provided a comfortable 250 km (155 mi) range. Another advantage was their small size, making them less conspicuous targets. Maintenance and repair were also simplified. Light, they were able to cross weakened or even hastily built wooden bridges. These vehicles took part in the later stage of the Polish-Soviet war, in July and August 1920. They fought in the battles along the Wkra river and in the battle of Warsaw, with the 8th Cavalry Brigade of the 1st Army. The FT-B also participated in the battle of Kowel and many other engagements. The last ones joined the 1st Light Armoured Car Column, part of the 5th Army of Gen. Władysław Sikorski. But the most successful engagement was the raid on Kovel (Ukraine), 11-12 September 1920, going nearly 100 km (60 mi) deep in enemy territory, capturing a large railroad junction and tonnes of materials and supplies. The 2nd Light Armoured Car Column was active until the fall of 1920 on the northern part of the front, at Białystok and Suwałki, against the Lithuanians. Some issues existed however with the Ford: The interior was so cramped that the driver had to steer in an uncomfortable squatting position, tiring quickly on the long run. During long cross-country drives, the engine overheated rapidly. However, most of its off-road qualities came from a high ground clearance and “gusmatic” type bulletproof tires. The weight of the armor put a strain on the suspension springs. At the end of the war, another series of 30 improved vehicles was rejected. Nevertheless, the 12 surviving Ford FT-Bs served until 1927, being withdrawn by 1931. According to photos, three at least were named by their crews, “Osa” (wasp), “Mucha” (fly), and “Komar” (mosquito). These were in minority compared to the 40 or so captured Soviet armored cars. Typical FT-B in the summer of 1920.